QuikHEAL ointment, containing ingredients including sulphur and copper sulphate, is an antifungal ointment for eliminating Greasy Heel fast. The lipid base means it is not only easy to apply but also works as a water barrier to help keep moisture away from the area. 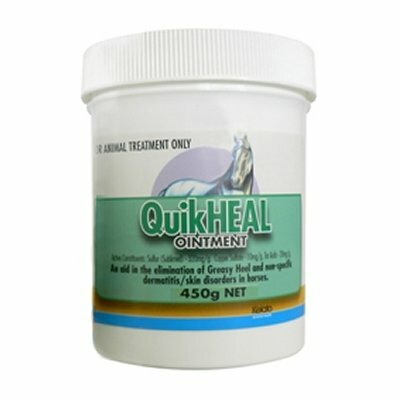 The antifungal and antibacterial properties of QuikHEAL mean it is also excellent at helping to relieve general skin disorders such as mange, girth rash, nicks and cuts, rain scald, dermatitis.